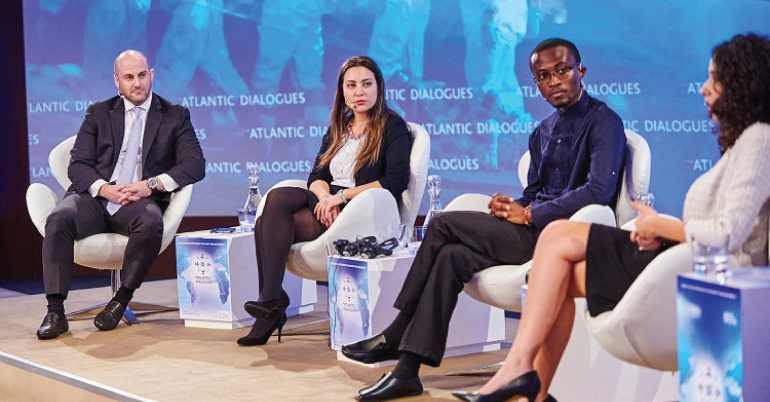 Every year, the Atlantic Dialogues Emerging Leaders Program brings together 40 to 50 young leaders, aged 23 to 35, from around the Atlantic basin and Africa, who have demonstrated leadership and initiative in their fields and who aim to shape the regional and global agenda in politics, finance, business, civil society, academia and the media. These rising leaders have displayed leadership capabilities, and have a strong sense of commitment to social and economic issues facing their communities in particular and the world in general. This yearly program is held two days prior to the Atlantic Dialogues conference, and is a tailor-made policy immersion program that consists of structured group conversations with decision and opinion makers on key Atlantic development and cooperation issues, as well as informal meetings with innovative community leaders and think tank representatives. The ADELs join the Atlantic Dialogues Conference immediately after the program as full participants, and are presented with the unique opportunity to attend this high-level event, network with leading figures of the Atlantic Basin, and speak in different sessions as well as the final plenary dedicated to that specific year’s cohort. The aim of this program was initially to increase intergenerational dialogue within the conference itself, but this notion has been evolving throughout the years. Eligible Regions: Africa, North America, South America, Central America, Europe, the Caribbean. Interested applicants should submit a copy of their resumes/ CVs in .pdf format, and a personal statement of no more than 250 words detailing their motivations for applying and their prospective contributions and benefits from the Atlantic Dialogues Emerging Leaders Program. The application form can be found below.